This lesson can be used as a pre-lesson for the Soulful Similes and Musical MetaphorsLesson plan. Simile: a figure of speech that compares two unrelated things using the words "like" or "as"
Students will be able to identify and determine the meaning of metaphors and similes. Students will be able to recognise and use linking words in similes using word banks and sentence frames for support. Tell students that today they will be learning to identify similes. 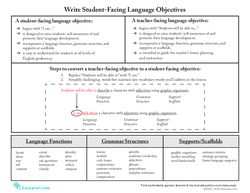 Write the content objective on the board in student-friendly language (i.e., "I can recognise and understand similes."). Write the word "simile" in large letters in the centre of a piece of chart paper and use it as a "brain dump." Give students a moment of thinking time to silently consider what they know (or want to know) about similes. Tell students to turn and talk to an elbow partner about what they know (or want to know). Call on volunteers to share the background knowledge, examples, and questions that they shared with (or heard from) their partner. Record student responses on the chart paper surrounding the word "simile." Add key facts to the brain dump to supplement student responses if needed (i.e., similes can be found in poems, songs, and stories). Display the vocabulary card with the key term SimileAnd review the definition with your students (a figure of speech that compares two unrelated things using the words "like" or "as"). Discuss the image on the card (i.e., "This picture of a building and a tree can help me understand the definition because, even though they are different, they have some similarities—they are both tall."). Hand out four blank vocabulary cards (or blank index cards) to each student and explain that there are other vocabulary words we need to understand as we learn about similes. Write the term Linking wordAnd its definition on the board (a word that connects the subject and another noun or adjective). Invite your students to do a choral reading of the word and definition. Then, instruct them to copy the word and definition onto one of their blank vocabulary cards. Remind them to leave space for an image. Have students draw a picture that will help them remember the definition (i.e., chain links or people holding hands). Repeat the process with the key terms Alike(two or more things that are similar), Similarities(characteristics or traits that are like another), and Compare(to point out the likeness between two or more things). Then, invite several students to share their drawings for each key term. Explain that most similes use a linking word to make a comparison between two things. Write the linking words "like" and "as" on the board and tell students that these are the two most common linking words they will find in similes. Write an example of a simile on the board, like "Dad is as loud as a lion when he is mad." Circle the linking word "as" and point out that it connects the subject, "dad," with the noun, "lion," and the adjective, "loud." Underline the two nouns being compared ("dad" and "lion") and explain that the dad is being compared to a lion because they are both loud. Point out that the similarity (they are loud) is explicitly stated in the simile. In this example, it is clearly stated how the two things that are being compared are alike. Write a second example of a simile on the board, like "The sequoia trees towered overhead like skyscrapers." Verbally define new vocabulary in the simile to support students' comprehension (e.g., a skyscraper is a tall building). Circle the linking word "like" and point out that it connects the subject, "trees," with the noun, "skyscrapers." Underline the two nouns being compared and explain that the trees are being compared to skyscrapers because they are both tall. Point out that the similarity (they are tall) is NotExplicitly stated in the simile. 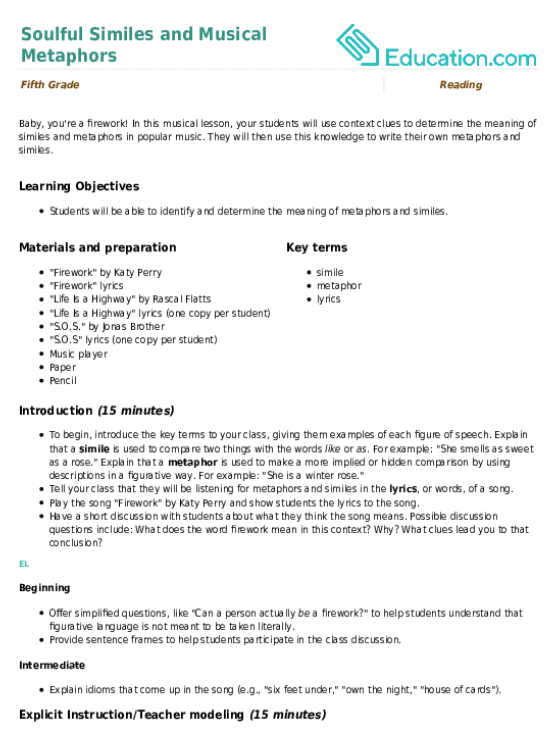 In this example, it is up to the reader to determine how the two things that are being compared are alike. However, there are clues that can help us figure out the similarity, like the phrase "towered overhead." Reiterate that in some similes, the similarities will be stated, while in others, students will need to determine the similarity themselves. 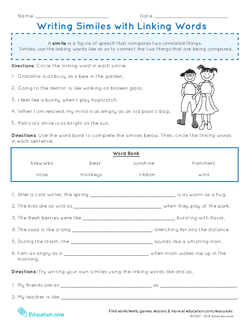 Display the top section of the worksheet Writing Similes with Linking Words and guide your students though the first sentence as an example. Then, hand out the worksheet and instruct your students to work with a partner to complete the rest of the worksheet. Call on students to share their answers. 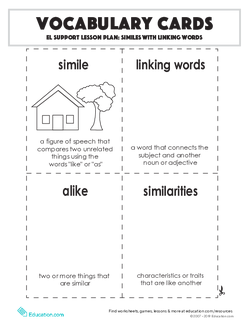 Tell your students that they will now be analyzing similes and remind them that, in order to understand the meaning of a simile, they must look for similarities between the two things that are being compared. Hand out the worksheet Reading & Understanding Similes. Read the directions aloud and review the example with the class. Complete one additional example and model your thinking (i.e., "This simile is comparing life to a road. It says that they both have twists and turns, which means that they both can change as we move forward. They are similar because they both change over time."). Circle the linking word "like" and remind students that the linking word is a clue about what two things are being compared. Have students work with a partner to complete the rest of section one on the worksheet. Instruct them to circle the linking word in each metaphor before filling in the sentence frame. Then, call on volunteers to read their completed sentence frames aloud. Review the directions for section two, then read the short story aloud as students follow along. Instruct students to reread the story with a partner, looking for a simile as they read. 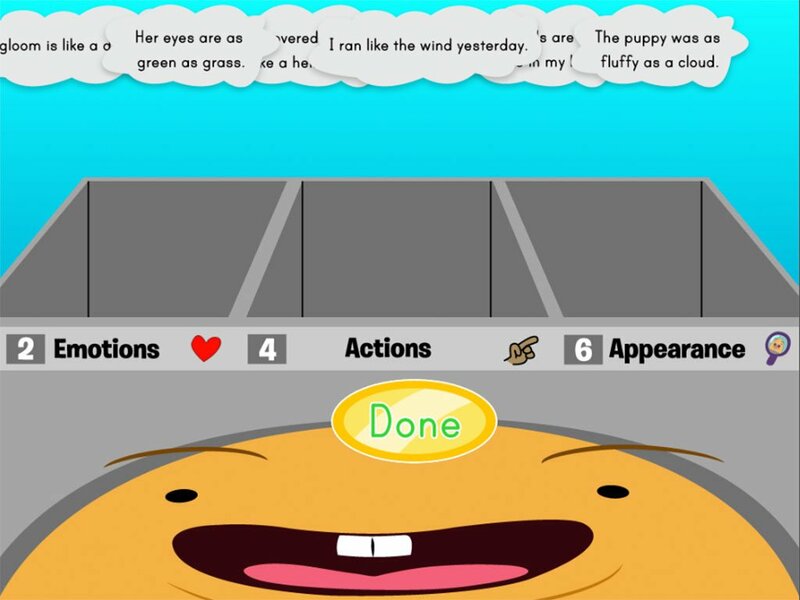 Allow students to discuss the simile and complete the sentence frame task with their partner. Invite three students to share their answers. Select student volunteers intentionally so that all three similes are revealed (i.e., bell/thunder, tears/raindrops, smile/sunshine). Ask students to identify the linking words in the similes they share from the story. Provide additional sentence frames to support students during speaking tasks (i.e., "I want to know ____ about similes."). 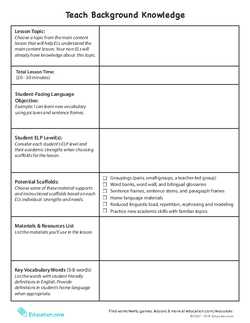 Pre-teach additional grade-level vocabulary that students will encounter on the worksheets (i.e., "graceful," "delicate"). 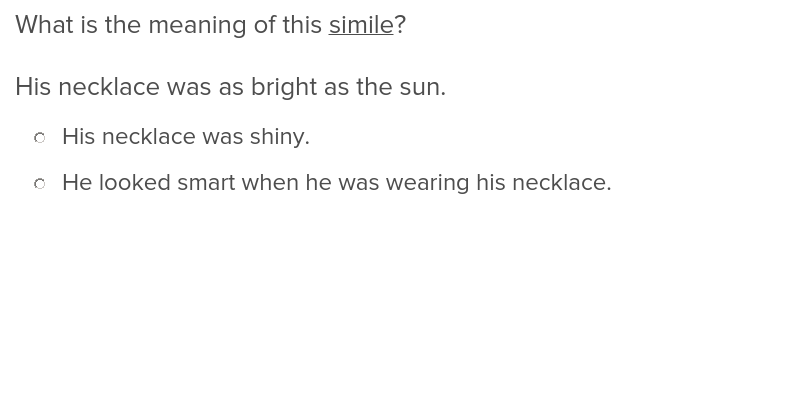 Support students in completing a Frayer Model for one of the key terms, like "simile." 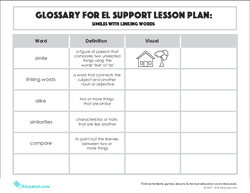 Allow beginning ELs to use bilingual resources to define new words throughout the lesson. Strategically pair beginning ELs with more advanced ELs or students who speak the same home language. 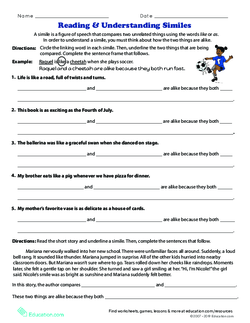 Encourage advanced ELs to compose sentences and responses without sentence frames, or with shortened sentence stems. Allow advanced ELs to utilize a glossary, thesaurus, and dictionary for help with unfamiliar words. Choose advanced ELs to share their ideas first in group and class discussions. Ask advanced ELs to add on, rephrase, or clarify what their peers say in class discussion. 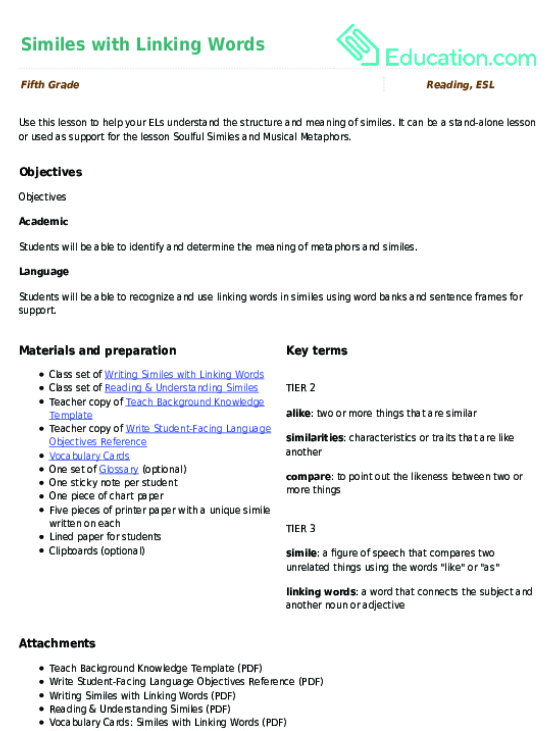 Have advanced ELs repeat instructions and key vocabulary, summarizing important information for the class. Hand out a sheet of lined paper to each student and instruct them to number their paper from one to five. Write a sentence frame on the board that reads, "____And ____Are alike because they both____." Tell students that they may use the sentence frame as support during the activity. 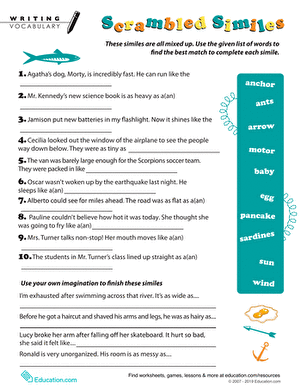 Guide your students through a scoot activity using the displayed similes. Instruct students to read the simile and write a sentence explaining its meaning. Remind them to use the sentence frame for support. Tell students to record their response next to the number on their paper that aligns with the number of the simile (i.e., if they start at simile three, they should write their response next to number three on their paper). After one minute, signal your students to move to the next displayed simile (i.e., if they are at simile number three, then they should move to number four). Continue the activity until all students have visited each of the five similes. Collect students' scoot responses to gauge understanding. Direct students' attention back to the brain dump and explain that they will be reflecting on what they learned about similes. Give students a minute of thinking time to quietly review the brain dump. Hand out a sticky note to each student and tell them to choose a sentence stem (or write their own sentence) to reflect on the lesson. Invite students to add their sticky note reflections to the brain dump. Read some of the student responses aloud and make connections to some of the initial understandings that were shared earlier in the lesson (i.e., draw arrows from the original responses to the new sticky note reflections). Swift as a coursing river, your students will get the hang of similes with this creativity-fuelled writing lesson.